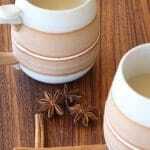 Supremely sippable and exotically fragrant, Masala Chai is easy to make at home. Grind the whole spices in a mortar and pestle or spice grinder. Place the milk and water in a medium saucepan and add the spices, ginger and brown sugar. Over medium-high heat, bring to a boil, reduce the heat to low and simmer gently for 4 minutes, stirring occasionally to keep the milk from boiling over. Remove from the heat and add the tea; steep for 4 minutes. Strain and serve.